Mark Elliot Zuckerberg was born on May 14, 1984, in White Plains, New York and raised in Dobbs Ferry, New York. He started programming when he was in middle school. Early on, Zuckerberg enjoyed developing computer programs, especially communication tools and games, and a music player named Synapse that used artificial intelligence to learn the user's listening habits. Microsoft and AOL tried to purchase Synapse and recruit Zuckerberg, but he decided to attend Harvard University instead. "Let the hacking begin", wrote Zuckerberg about midnight and started. Thus Zuckerberg decided to create student directory with photos and basic personal information, called Facemash, which used photos compiled from the online facebooks of nine dormitory Houses, placing two next to each other at a time and asking users to choose the hotter person. To accomplish this, Mark hacked into the protected areas of Harvard's computer network and copied the houses' private dormitory ID images. Harvard at that time did not have a student directory with photos and basic information and the Facemash site generated 450 visitors and 22000 photo-views in its first several hours online. That the initial site mirrored people’s physical community—with their real identities, represented the key aspects of what later became Facebook. The site was quickly forwarded to several campus group list-servers but was shut down a few days later by the Harvard administration. Zuckerberg got into trouble, being charged by the administration with breach of security, violating copyrights and violating individual privacy and faced expulsion, but ultimately the charges were dropped. The following semester, in January 2004, Mark began writing code for a new website. In February, 2004, he launched Thefacebook site, initially located at URL thefacebook.com. When Zuckerberg finished the site, he told a couple of friends, and one of them put it on an online mailing list. Immediately several dozen people joined, and then they were telling people at the other houses. It was like avalanche, within twenty-four hours, Thefacebook had somewhere between twelve hundred and fifteen hundred registrants. Initially membership was initially restricted to students of Harvard College, and within the first month, more than half the undergraduate population at Harvard was registered on the site. Mark soon attracted assistants, in order promote the website—Eduardo Saverin (business aspects), Dustin Moskovitz (programmer), Andrew McCollum (graphic artist), and Chris Hughes. In March 2004, Facebook expanded to 3 other Universities—Stanford, Columbia, and Yale. This expansion continued when it opened to all Ivy League and Boston area schools, and gradually most universities in Canada and the United States. The company Facebook incorporated in the summer of 2004 and the entrepreneur Sean Parker, who had been informally advising Zuckerberg, became the company's president. At the same time the company received its first investment of US$500000 from PayPal co-founder Peter Thiel and moved its base of operations to Palo Alto, California. The company dropped The from its name after purchasing the domain name facebook.com in 2005 for $200000. Facebook launched a high school version in September 2005, at that time, high school networks required an invitation to join. Facebook later expanded membership eligibility to employees of several companies, including Microsoft and Apple. And finally on September 26, 2006, Facebook was opened to everyone of ages 13 and older with a valid e-mail address. Users of Facebook can create profiles with photos, lists of personal interests, contact information and other personal information. Users can upload any of their own photos whether they were taken digitally or in a photo booth hire. While some users choose candid photos as their profile picture, posed photo booth style photos often make the best ones. Communicating with friends and other users can be done through private or public messages or a chat feature. Users can also create and join interest and fan groups, some of which are maintained by organizations as a means of advertising. To combat privacy concerns, Facebook enables users to choose their own privacy settings and choose who can see what parts of their profile. Facebook is free to users and generates revenue from advertising, such as banner ads. By default, the viewing of detailed profile data is restricted to users from the same network and reasonable community limitations. Microsoft is Facebook's exclusive partner for serving banner advertising, and as such Facebook only serves advertisements that exist in Microsoft's advertisement inventory. According to comScore, an internet marketing research company, Facebook collects as much data from its visitors as Google and Microsoft, but considerably less than Yahoo! Facebook has a number of features, with which users may interact. They include the Wall, a space on every user's profile page that allows friends to post messages for the user to see and to post attachments, depending on privacy settings, anyone who can see a user's profile can also view that user's Wall; Pokes, which allows users to send a virtual poke to each other (a notification then tells a user that they have been poked); Photos, where users can upload albums and photos; Status, which allows users to inform their friends of their whereabouts and actions; etc. The front-end servers of Facebook are running a PHP LAMP stack with the addition of Memcache, and the back-end services are written in a variety of languages including C++, Java, Python and Erlang. Other components of the Facebook infrastructure (which have been released as open source projects) include Scribe, Thrift and Cassandra, as well as existing open-source components such as ODS. Today, Facebook is the leading social networking site based on monthly unique visitors, especially in English-speaking countries, including Canada, the United Kingdom and the United States, having overtaken main competitor MySpace in April 2008. ComScore reports that Facebook attracted 132.1 million unique visitors in June 2008, compared to MySpace, which attracted 117.6 million. 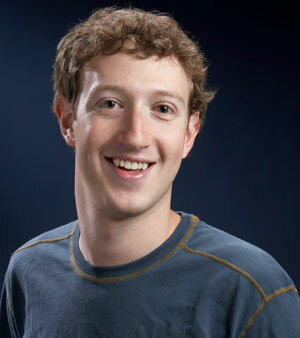 As of January 2010 Zuckerberg is the youngest self-made businessman worth more than a billion dollars.